Publisher: No printer / publisher information provided. 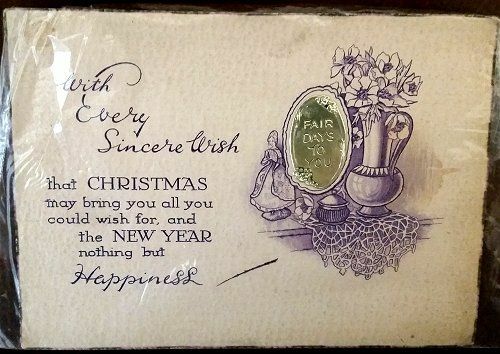 Condition: Postally unused, but "From Mabel" written on back. Some soiling and creasing to textured and "burnt edge" style cardstock. Description: This comes from the large collection of WW1 era postcards purchased during deployment to Europe by an American "Doughboy" soldier. The photos could not capture the contrast of the lovely shiny silver foil medallion that has "Fair Days to You" and flowers embossed in it.